A Royal Air Force officer, Colin Bruce has undertaken a broad variety of intelligence roles in the UK and deployed, including the leadership of intelligence production units and capabilities and intelligence support to joint, air and law enforcement operations. 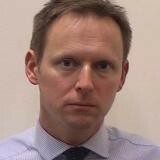 He is currently Chief of Staff and Deputy Head for Analysis at the UK’s National Centre for Geospatial Intelligence. He is also Director of the Joint Intelligence Operations Centre, aligning UK Defence requirements with collection and analytic capacity. Check out the incredible speaker line-up to see who will be joining Colin .